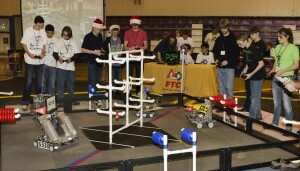 The Olympia School District hosted the South Washington FTC District Championships on Saturday, December 15. 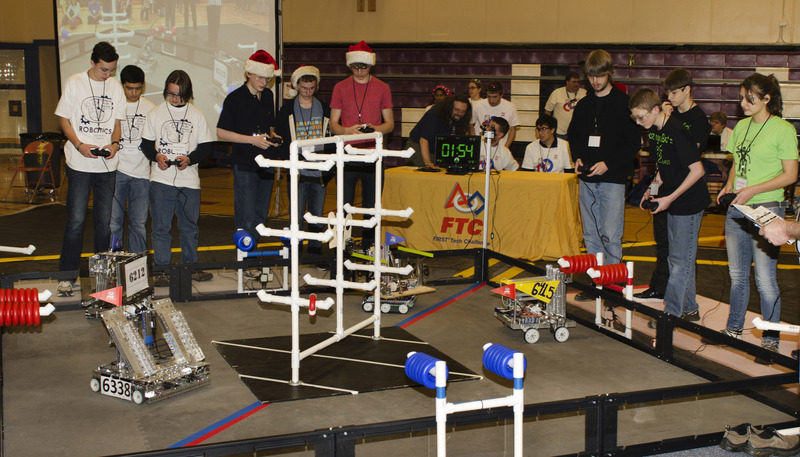 Twenty-four FTC (FIRST Tech Challenge) teams from Tacoma to Vancouver converged at Jefferson Middle School to compete in this year’s challenge, “Ring it Up” (see this video animation). OSD FTC teams from Avanti, Capital and Olympia high schools all had a tremendously successful day, with Team Swag from Capital and the Oly Cow and Brobo teams from Olympia High School advancing to the FTC State Championships on January 12. Five of the six OSD teams made it to the elimination round; Avanti’s Fluffly Spider Monkeys(4448) and TANK Robots (6338) along with Team Swag (5061) and the Technicians (6211) from Capital and Oly Cow (6424) of OHS. 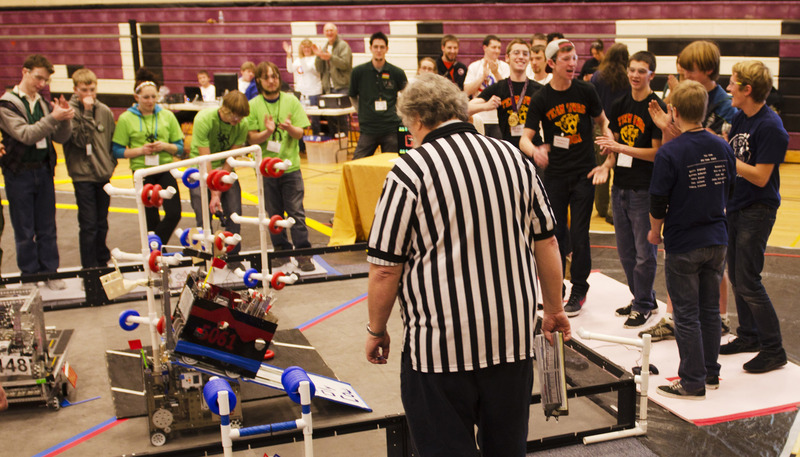 Three of the four elimination round alliances were “captained” by OSD teams; 4448, 5061, and 6211. Team Swag from CHS made it to the finals, and earned a spot at the State Championships. 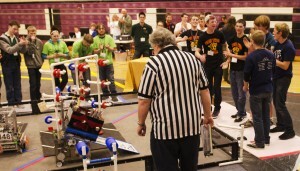 In one semi-final match, the CHS and OHS teams partnered to score a record 506 points in a single match. All OSD schools also did exceptionally well in the judging and the OSD teams provided some of the best examples of sportsmanship and Gracious Professionalism at the event. 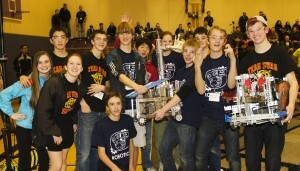 Both OHS teams, Oly Cow and Brodo, won key engineering awards which also earned them slots at the State Championships. Avanti’s 4448 team impressed everyone when they took a timeout to let their opponent (from CHS) finish repairing their robot prior to the deciding match in the semi-finals – a move which arguably cost them a birth at State, when CHS won the subsequent match. 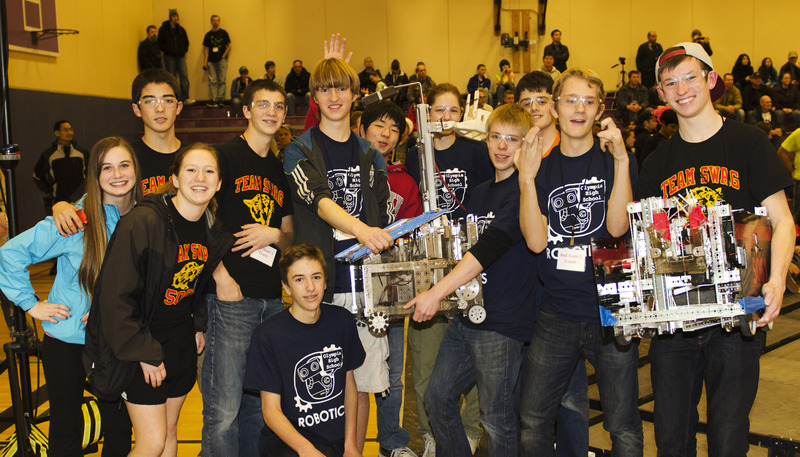 Congratulations to all our OSD FTC teams, and best wishes to our representatives at the State Championships.